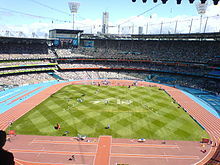 The site for the opening and closing ceremonies was the Melbourne Cricket Ground which was also used during 1956 Summer Olympics. The mascot for the games was Karak, a red-tailed black cockatoo (a threatened species). The official song of the games, "Together We Are One", was composed by the ARIA awardee Australian recording artist Delta Goodrem. During the closing ceremony of the games, President of the Commonwealth Games Federation Mike Fennell declared to the crowd "Melbourne, you are simply the best". The BBC covered the Commonwealth Games in the United Kingdom on BBC One and BBC Two. BBCi included a choice of two extra video streams on Freeview and four streams on Digital Satellite and Cable. Users with broadband in the United Kingdom could also view all 5 video streams on bbc.co.uk, and the BBC Sport website. The Stolenwealth Games were protests at the 1982 and 2006 Commonwealth Games. People were protesting because they believed that the Commonwealth Games lead to the erasure of indigenous people. There were also problems with land rights. These protests lead to the creation of the Global Indigenous Games. ^ The four Home Nations of the United Kingdom — England, Scotland, Wales and Northern Ireland — send separate teams to the Commonwealth Games, as do the three Crown Dependencies — Jersey, the Isle of Man and Guernsey — and 9 of the 14 British Overseas Territories. The Cook Islands and Niue, non-sovereign territories in free association with New Zealand also compete separately. There are thus 53 members of the Commonwealth of Nations, but 71 competing teams at the Commonwealth Games. ^ 1911-2010 Australia at the Commonwealth Games: Delhi 2010 XIX Commonwealth Games 3-14 October. Melbourne: Australian Commonwealth Games Association. 2010. p. 111. ISBN 0958019010. ^ "Melbourne 2006". Commonwealth Games Federation. Retrieved 1 May 2018. ^ Editor, Anton La Guardia, Diplomatic (8 December 2003). "Zimbabwe quits Commonwealth over suspension". ISSN 0307-1235. Retrieved 1 May 2018. ^ a b "M2006 > Sports and Venues > Venue Statistics". m2006.thecgf.com. Retrieved 1 May 2018. ^ "M2006 > Sports and Venues > Venue Locations > Melbourne Cricket Ground (MCG)". m2006.thecgf.com. Retrieved 1 May 2018. ^ "Games farewelled with spectacular party - Breaking News - Sport - Breaking News". smh.com.au. Retrieved 2 May 2018. ^ "M2006 > Queen's Baton Relay". qbr.m2006.thecgf.com. Retrieved 1 May 2018. ^ "M2006 > Schedule and Results > Medals". m2006.thecgf.com. Retrieved 1 May 2018. ^ "COMMONWEALTH GAMES: Melbourne looks set to host 2006 Commonwealth Games". The Independent. 11 April 1999. ^ "Commonwealth Games spending within budget - National - theage.com.au". theage.com.au. Retrieved 2 May 2018. ^ "TWI Wins Contract to Host Broadcast Commonwealth Games | News | Sportcal". sportcal.com. Retrieved 29 April 2018. ^ "Nine wins Sunday with Games closing ceremony - TV & Radio - Entertainment". smh.com.au. Retrieved 29 April 2018. ^ "Melbourne coverage | BBC". 1 March 2006. Retrieved 29 April 2018. ^ "CBC Sports Commonwealth Games Schedule | Pedal Magazine". Pedal Magazine. 24 January 2006. Retrieved 29 April 2018. ^ "TVNZ To Broadcast The Melbourne 2006 Commonwealth Games In New Zealand | News | Sportcal". sportcal.com. Retrieved 29 April 2018. ^ "Prasar Bharati bags broadcast rights for 2006 Commonwealth Games". Indian Advertising Media & Marketing News – exchange4media. Retrieved 29 April 2018. ^ "Cable Bahamas brings the XVIII Commonwealth Games to Bahamians on Cable 12". cablebahamas. ^ "M2006 > Media Centre > Newsletter > Display". ^ "M2006 > Getting Involved > Sponsorship". m2006.thecgf.com. Retrieved 1 May 2018. ^ Whinnett, Ellen (22 March 2006). "Mystery of missing athletes". Herald Sun. ^ "Athletes 'go missing from Games'". BBC News Online. 23 March 2006. ^ "Visas for second group of athletes". The Age. 28 March 2006. ^ Latimore, Jack (8 April 2018). "'The fight never left': Stolenwealth Games protesters draw on long tradition". the Guardian. Retrieved 3 November 2018.